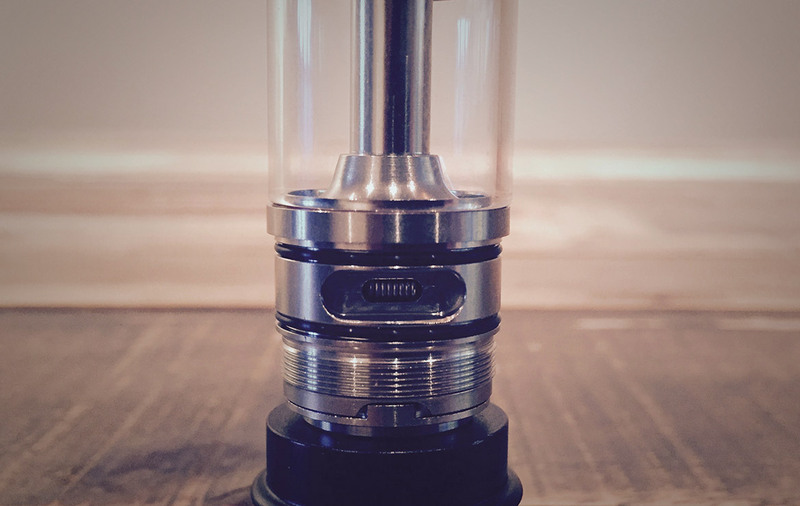 This is one high end looking tank and we are so stoked to see so many RDTAs hitting the market. Enough lately for us to start a new subcategory on the site! Well Youde has done a bang up job for their first attempt at this new style of Atty. The Bellus is one tank you need to check out! This is an awesome tank in a tight little package. Youde has done a great job with making this a rather small yet powerful RDTA. The tolerances all over this tank are the tightest we have seen with the vapor chamber being the tightest of them all. And of course this leads to great Flavour and easy builds with results that are easy to replicate. However with everything being so spot on, we don’t suggest beginners pick this one up without some help from someone more experienced. The potential for shorts are high, you need to know the rules of building for this one. 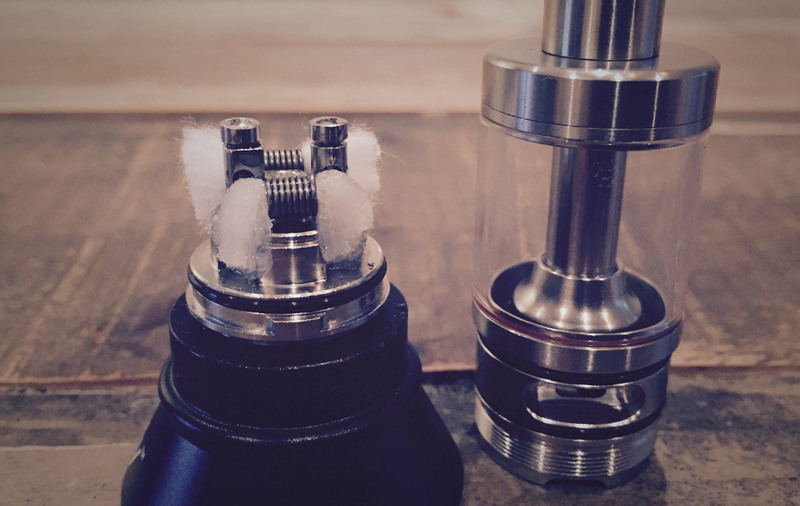 The best results are accomplished when the coils are skirting the limits and barely clearing the chamber/air holes. Don’t let this freak you out, we haven’t had a single issue, you just need to respect this design and be careful (double check your tolerances along the way) is all. The Flavour is on point! Smooth silky airflow and dense vapor help make this a rather enjoyable vape. It’s a hard call on whether the Bellus has a leg up on the Aromamizer, it’s a bit of a dead heat on flavour and comes down to other personal preferences; airflow, filling, aesthetics, etc… The Tolerances again allow for quite a bit of versatility, you can get a really warm to rather cool vape by playing with your wire gage. Youde has really improved their screw heads, it’s a much better Build deck than pervious UD offerings. Even with everything being so compact, you will find this easier to build than any of the Goliaths or Goblins. With the gages of wire we have thrown at it we have had nothing but great experiences. So how should you build it? Well it won’t fit anything bigger than a 2.5mm coil so stick somewhere between 2-2.5mm and we suggest 26ga wire. 24ga just makes everything run a little too warm. We are digging a 26ga, 2.5mm, Spaced Dual Coil build coming in at 0.35-0.4 Ohms (7 wraps a side). It’s a slightly warm vape and super tasty while keeping everything running rather cool. Run it between 40-45W and you’re golden with some battery life to kill. The deck design may annoy some of you, it’s small and hard for large hands to get it out of the tank. It can also cause some trouble when preheating or burning in your coils as there isn’t a lot to grab onto once you’re done and it’s steaming hot. We found placing the tank on it to unscrew it from you mod was the way to go, so don’t fill your tank till your build is complete. As for Coil alignment, sit your coils centred with the post holes, they should be perfectly centred vertically with the AFC holes. Your coils should be as far out towards the center ring as you can without hitting it for best Flavour. Wicking is the easiest to accomplish of any UD product to date. Thankfully you don’t need to stress or become a hairstylist for this one. Simply place the wicks in your coils and make them just hit the base of the deck. You don’t want to overstuff the juice channels but there must be cotton in them for this design. Essentially the wicks act as the seal to prevent leaking through the AFC. So keep the cotton not too loose but definitely not tight in your coils. You want them to stay put but to slide through the coil with just a slight tug on a wick end. We found trimming the wicks just inside the circumference of the deck and then wetting and trimming to fit was the easiest way to go. You want to hear a click when inserting the deck into the tank, if you do you should be good. That click is the wicks sealing the vapor chamber. You will know if you don’t have enough wick, she will leak. As a basic rule fill the channels more than you think you should but don’t go crazy. Filling is super easy thanks to a decent top fill that works! The fill holes are on the small side, really it would have been nice to see just slightly larger holes. You need a fine tipped dropper, unicorn bottle, or syringe to fill it cleanly. Large tipped droppers will work but make a mess and cause a slight bit of leaking out the AFC when filling. Closing off the AFC before refilling is always a good idea and helps keep everything nice and tidy. The 5ml capacity is pretty good, it’s a hungry atty, expect to go through at least 3 tanks a day for medium-high vaping. Airflow is silky smooth, really good. The AFC functions better than we suspected it would. We have found closing it off to 4 holes a side garners the best flavour. Fully open there is a slight bite on the flavour, but you can get some decent cloudage for a Flavourchaser. There is just something magical that happens when you close it down, we suspect it helps create a bit of a vortex that improves the flavour and turbulence hitting your coils. So it’s a versatile AFC, but it does sweat a bit and is too be expected with the matrix of tiny dots. Nothing to get upset about but you will be wiping things down once and a while. We haven’t tried a single build but we suspect the performance will be quite good. One little gripe, the AFC ring is pretty loose, it turns very easily but holds it’s position pretty well (you will find yourself double checking it though). The RDTA category of attys is super new and there are more hitting the market every day. It’s exciting times and great to see a whole new type of atty to play with that offers a hybrid of convience of a tank with the Flavour of an RDA. 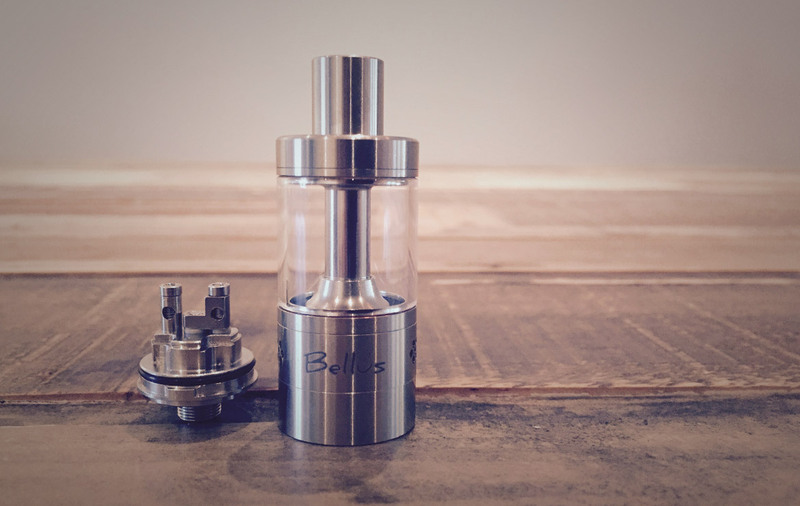 The Bellus is definitely a current front runner with great looks, great design ideas and pretty awesome Flavour. 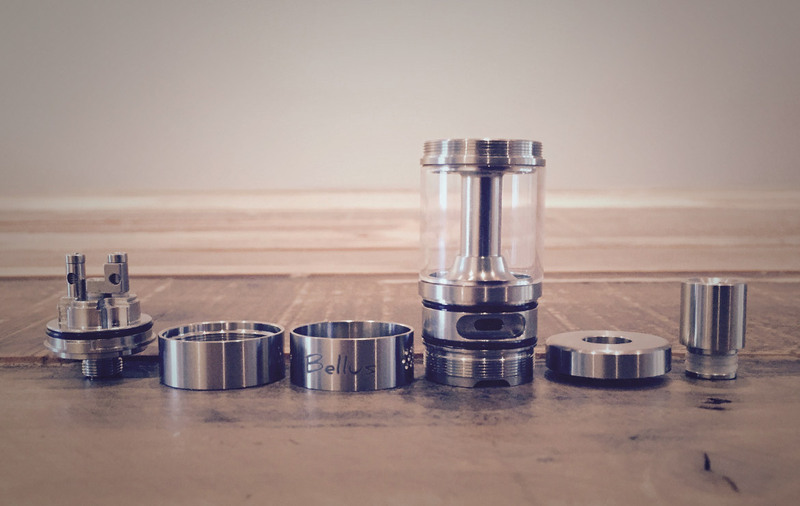 Youde has always been one of our favourite atty companies and we are stoked to see what they come up with next. 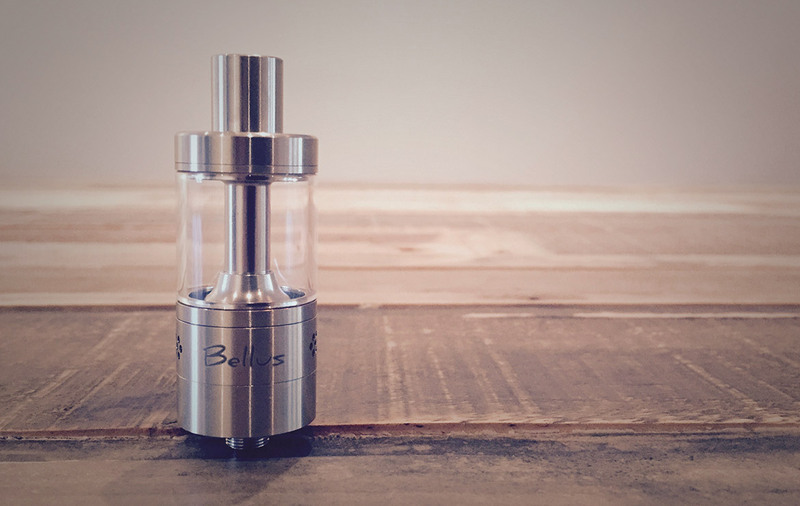 The Bellus is an easy purchase decision at the price and a great intro to the world of RDTAs.